Gertie's New Blog for Better Sewing: Blogiversary Giveaway! To enter, just leave a comment on this post by midnight EST on Friday, the 25th. Readers from all locations are eligible. I will choose two winners by random number generator on Saturday. Thanks to Sarai of Colette Patterns for sponsoring part of this prize! Happy Anniversary!!!! That is so nice of you to do a giveaway. I have been wanting to try a Collette pattern. Yay! 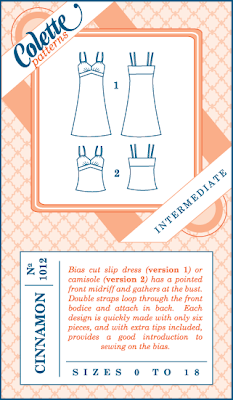 I would love to win a Colette sewing pattern. My only problem would be trying to decide which ones to start with first. I've been dying to try a Collette pattern and I haven't mustered up the guts yet! What a great giveaway! Congrats on making it a year sister! Absolutely LOVE your blog and have very much enjoyed following your sewing adventures. Congratulations and thanks for all of the inspiration! Me me me! *jumps up and down* I would love Chantilly and Cinamon. Happy blogiversary! I have never used a Collette pattern, but I would love to! Thanks! I've so much enjoyed reading your blog! I started skimming sewing blogs in about May of last year, I think, and I'm not really sure how long I've been reading yours--several months at least. I like your mix of vintage, sewing and feminism topics, and have really appreciated the tutorials. I hope you'll stay inspired and keep sharing. Happy Blogiversary! And--of course--I'd love to have the Collete Patterns gift certificate; after all, you were one of my main inspirations to buy and try the Sencha blouse pattern, which I love. Happy Blogaversary. I can't believe you've only been doing this for a year! I've got a stack of Collette patterns to sew at home, but her items are so lovely I keep feeling the urge to be a completist and get the whole collection! Happy blogiversary! I've been blogging for almost 4 years, and I've loved every minute of it! I love Colette patterns, and since I saw the restyled patterns I've been thinking of Parfait and Chantilly. By the way, I can't believe you've only blogged for a year. Not only do you write every day, but you have something witty and insightful and interesting to say everyday ! Thank you so much for the inspiration. Now, when I want to relax, I sit back, read your blog, and enjoy. Always a moment to look forward to ! A dreamy giveaway for sure! Happy Anniversary to you and your readers! Congratulations on blogging for a year! You've accomplished a lot in this year! Happy Anniversary - I love Colette Patterns - I've made the Macaron the and I'm about to make a second. Congrats on the success of your blog - I find it a "must read." Congratulations. I love reading your blog. Thanks for such a great giveaway. I love reading your blog! What a fabulous prize! I've been dying to try one of the Colette patterns. It's so nice of you (and Sarai) to give your readers a present. Really love your blog. I'm still mostly a theoretical sewer, in that I have grand ambitions and plans and am absolutely terrified to actually cut into fabric, but reading your blog gives me courage! Happy Blogiversary, so generous of you to host giveaways! I love Colette Patterns! Happy blogiversary again. You weren't lying; that is a great giveaway. Oh, too many things to love. Ceylon may be my favorite with Rooibos and Sencha close on its heels. This is a very generous giveaway, Gertie. Thank you for offering it. I love the Colette patterns. I don't own one yet; so I'm crossing my fingers. And again, Happy blogoversary. I have an interesting post coming out on my sewing blog tomorrow; so please stop by if you would like to get to know me a little better. Happy anniversary :) I love your blog and have read it every day for months! Happy Anniversary, Gertie! The only reason I don't have a Colette pattern yet is that I can't decide between them! Thanks for the giveaway! Yep, That's a very attractive pattern. Happy anniversary and please enter me in the drawing. Thank you! Oooh, great giveaway! Congrats on your blogiversary. I can't believe it's been a year already. I've learnt so much from you and been so inspired. Thank you! Awesome giveaway, Gertie, just like your awesome blog! I have been wanting to try a Collette pattern since I found out about them a few weeks ago. I am obsessed with these patterns, and I still haven't ordered one! A $25 gift card will have me spending even more, for sure. What an appropriate giveaway! I've been lusting after Collette patterns for some time now but haven't tried one. Thank you for all of your thought provoking, informative, entertaining blog posts this year. I wake up every morning wondering what Gertie has to say. Thank you! Congratulations on your first year! I have been lusting over the collette patterns for a while now, just haven't managed to get any yet! Oh Wow, what an awesome giveaway! Happy Blog-iversary!! Congratulations! I've been so inspired and informed by your blog. Thank you! Happy Anniversary. I've been here from the start! Colette Patterns is my FAVORITE independent pattern company (I wish I lived in Portland so I could work for her). I love reading your blog, especially all articles with a feminist perspective on fashion, sewing etc. I would also love winning a Collette pattern, since I have never tried one before. Happy Anniversary. Those patterns are way too cute. I LIKEY Cinnamon too. I love Colette patterns! Congrats on blogging for a year! Yikes, it's a year already! I'm glad you're still enjoying having your blog because it looks like there are alot of us who read it daily! Thanks for all the tips and inspiration. I guessed that it would be Colette! Yay! Happy Anniversary!!!! Happy anniversary! I've followed and loved your blog since the very beginning... and YAY! I adore Colette Patterns, so fingers crossed! Happy anniversary! Here's to many more years and many more wonderful patterns. Happy Bogiversary! I've learned so much from reading your sewing adventures. Please toss my name into the hat for your give-away. Before reading you posts today I thought your blog was around for much more than a year. Happy Blogiversary. Happy Blogiversary! I've really enjoyed your blog-I started reading last fall when I got my Bernina 210 and became serious about sewing clothes. I'd love to try a Colette pattern! Happy Blogiversary! I enjoy your creations and the thoughtful discussions that remind me that clothing is so much more than just fabric stitched together to keep us from being naked. And what a generous giveaway. I would love to try a Colette pattern. I would love to add another Colette to my collection! Thanks for the giveaway, but more, thanks for the blog and for generously sharing your knowledge/thoughts/etc. Happy Anniversary! I love your blog. It always inspires me to get back behind my sewing machine. Happy Blog Anniversary! I've been wanting to try the colette patterns. Happy Blogiversary! Yours has definfitely become my "go-to" blog for, well, pretty much everything. Is it wrong that I heart it so much? Congrats on a great first year of blogging! Yoou've inspired me to look for vintage-styled patterns to try so I can finally have something that really suits my figure. Thanks to you and to Sarai for such a generous prize! I love the desings but am yet to try Colette patterns. Thank you! Thanks for another great give away. It is a great prize. Your blog has inspired me so much. Congrats! The Colette patterns are fantastic, although I haven't tried them yet. And it really seems like a good way to celebrate because I discovered them thanks to your blog. Which is fantastic in many ways. Oooh yay!! I love everything you've made with Colette Patterns so what a great opportunity to make some of my own! I just found your wonderful blog yesterday and already a giveaway! I still have many back posts to read. I'd love to be entered. Thanks! Hi! I'm new to your blog, but funnily enough, I found it via the Colette patterns website. I am a big admirer of your versions of the Colette patterns. I hope I win!!! Awesome. Congratulations on a successful year on the internet! Your posts are very inspiring. Wow, what a generous giveaway! I've been reading your blog for several months now and you've really inspired me to learn to sew my own clothes, thank you so much for sharing with us! Happy Blogiversary!! What a great give-away! Congratulations on your blogiversary!!! Thanks for putting out so much great stuff to read :) Best wishes for a great year two! Happy anniversary! I can't say I've been reading your blog for more than a couple of months. But once I found your blog, I spent the evening reading it all up! I appreciate so much, what you share. I get a little annoyed with *crafty* blogs that have lots and lots of tutorials on how to fake something that everyother crafty blog is also faking. I really appreciate that the information you share is aabout sewing things the right way. I learned to sew when I was just a kid, from my Grandma. She taught me the right way. I went to sewing camp in the summers (mostly with older women) and even took some pattern drafting and the like, classes in school. I love coming to your blog and reading about they hows and the whys to good sewing techniques. I think a lot of the details of handmaking have been lost over the last generations. In addition to the great information you share, I love to see your own personal style! You are adorable. I also adore the Colette patterns! I finally just broke down and purchased one pattern last week. I can't wait to get my hands on it. I would have loved to have ordered a couple more. It just excites me to think that by leaving a comment on one of my new favorite blogs, I could end up with a new Collette pattern. It is fun even if I don't win. Congratulations, but most of all, I am so glad you are online and sharing! What a great giveaway. I've had my eye on one of their patterns for awhile now! I've just found your blog by the way and I love it! VERY inspirational. Happy Anniversary-my daughter has been directed to your site by me so often that she has decided to do a retro (1950s) wedding. I know, the era is a bit off, but you can take credit for the inspiration! one year of amazing blogging! thank you for sharing this with all of us, your blog inspires me so much in my own sewing projects. And I have been thinking about those pretty knew Colette Patterns for a while to. You are one of the reasons I wanted to take up sewing myself, and I've almost finished my first ever garment! Many happy more years blogging and sewing to you! Wow. A whole year? And what a nice prize. Free patterns are always good! Congrats on your anniversary! I can't believe that you have only been blogging for a year! I use your blog as a reference and for inspiration. Happy blogging! Great prize! I love Colette patterns. Thanks for a fantastic giveaway. I actually just bought my first Colette Patterns after reading about them here! I only just found your blog a few days ago, and have been enjoying reading the older entries. Happy anniversary! I never get the lucky number... Well, it's worth a try. Happy anniversary - I have enjoyed reading your posts over the year. What a great giveaway. Congrats on the anniversary! Seriously, I did not realize your blog had only been up for one year, due to its professional quality. Keep up the good work for many years to come! Oh wow! Happy Birthday to your blog! I've never sewn a Collette pattern but have wanted to for AGES. Keep up the good work Gertie, I've learned so much from you! Thanks for letting us share in your sewing adventures!! I wonder if the first time I read your blog was not because of your SBA tutorial on Colette pattern's blog! Your blog has been a real inspiration/motivation for me and my sewing. Keep it up! and dear lord couldn't we all use more Colette patterns. What an excellent prize!!! Happy blogiversary!!!! Happy Blogiversary. What a great giveaway!! Gertie - happy blogoversary, may you have many more! Happy Anniversary! I have to thank you for having such an addiction to vintage patterns. You've inspired me, taught me and made me sew a lot more clothing this summer - for me. I have been making stuff to sell for kids, but with you as my sewing fairy/guide, it's become much more fun to sew for me again. I have most of the colette patterns - I LOVE them! I don't comment very often on your blog but I love reading it. Thank you for the giveaway! I would love a shot at this. I have been oogling her patterns for a great while now. What a lovely way of celebrating your blog anniversary! I've been admiring a lot of Colette patterns from afar--perhaps they'll get me back into sewing. Happy anniversary - can't believe it's only been a year you have been such a help and inspiration. Would love to win a Colette pattern, they are so cute. Look at you, sharing again so soon. Thank you so much! Put me in for the drawing please! Yay! I love these patterns! the only reason I havent tried them yet is that Im a beginner, and trying not to spend too much on materials while im still screwing things up royally....but these patterns...glorious...I would love to win! Congrats! Keep up the great work. I can't tell you how much I appreciate and enjoy your blog. Happy Anniversary Gertie, thanks for a wonderful blog! Also, my word verification word is cooest. How weird is that? Happy Anniversary! I really enjoy your blog, and thank you for the generous giveaway! I have been following your site since it first started! I love it! I would love to win the Colette pattern - I love vintage styling, as does my 15 and 13 year old daughters! Thanks for everything Gertie! I love getting online every morning and reading about what you've been sewing. Happy Anniversary! You have inspired me to challenge my sewing and try patterns I would not have attempted in the past. Thank you! I enjoy reading your posts and actually used stay tape this past weekend on a short jacket thanks to your tips. I've never tried a collette pattern - it would be great to try! Happy Blogiversary! How exciting, I've been wanting to try Collette patterns but am short of funds currently. Happy Anniversary! I had no idea you had been blogging for less than a year! I read such quality stuff here :) You definitely inspire me as a beginner sewer. Woohoo. That is a great giveaway. Congratulations on your year anniversary! Congrats on year one, Gertie! Your blog and style are truly an inspiration, and I hope you continue this blog for years to come... It's kind of weird, but I feel like I know you so well, despite having never met or even corresponded with you. I guess that's the beauty of the internets! I should try another Collette Pattern! Cool giveaway! I hope I win, I've wanted to buy one of the Colette patterns for a while but don't really have the extra money! I have been craving some patterns from Collette to try out just haven't gotten them into the budget. Would be great to win! Wow what an awesome giveaway! I LOVE Colette patterns! I too am hankering for that beautiful slip pattern! Hooray for your first year of blogging. I just found your blog through so zo. And what a find. Going to check it out now. ANd i must say, that cinamon pattern is divine. Actually, somehow I was surprised that you've been blogging for "only" one year. You are quite awesome at it. And thank you Sarai for this chance. I am squealing in delight about this giveaway! I love Colette patterns and have yet to buy any of the new "undies" patterns. I want them both! Thanks for the fantastic giveaway and congrats on your blog-o-versary! well, i had better jump in on this one! i love her patterns. I have been eying one of her dress patters and the lovely coat pattern for a while now. Thanks for the contest! Happy Bolgiversary! I always enjoy your sewing,style, and shoes. I love your blog and these patterns. Both have made me more ambitious about my sewing, that's for sure! Happy anniversary for your blog! Those Collette patterns seem so interesting! I haven't tried one yet. Happy anniversary and keep up the good blogging! happy happy blogiversary gertie! all your posts are so interesting and thought provoking, not to mention inspirational. congratulations! Oooh! I have wanted the Rooibos pattern for the longest time! Happy Anniversary!! Happy anniversary! I found your blog several months ago and always look forward to your posts in my Google Reader. Happy Anniversary! Oh how I love giveaways! I hope I win! happy blogoversary! would love to win that pattern, thanks for the contest. I've been reading your blog everyday since I found it. I really think it's the best sewing blog on the net and I hope you keep it up for a looong time! I love Colette patterns and would really love to try several lof them, so I hope I win! Happy anniversary! Hope your second year is even better. I would love to win your great giveaway! Yes, I"ll play. I left a comment on the rpevious post but neglected to tell you I love your "updo". Will shameless derriere kissing give me a better chance of winning a pattern???? Happy anniversary! Your comment about the intersection of feminism and sewing sums up my initial and continuing attraction to your blog. I have truly enjoyed reading your blog! Congratulations on your anniversary! Here's to a great second year! I'd love to try a Colette pattern. This would be amazing. You are so inspiring. I have really enjoyed reading your blog and hope to have as much success with my new venture. Thanks! Happy blogiversary Gertie! I would love a chance at those gift certificates. Congrats on the blogiversary. Here's to many more and good luck on the Vogue New Book of Sewing Quest. Happy anniversary! Thanks for the awesome giveaway and all the time spent on this blog. I love reading it! Congratulations on your Blogiversary! I so enjoy reading your posts-you have truly inspired me to start sewing again. Thanks for all the time, effort and fun you put into your blog, its always a good read and I look forward to your regular posts. I'm a fan of Collette patterns too, and loved your creations from these patterns. Congratulations! May your wonderful blog live long and prosper! That's so exciting! :) Thanks for the work you've put into your blog this past year. Happy anniversary! I read your blog a couple of months ago on another computer and just found it again today! I'm so happy! BTW, I loved your post on vintage and how it can affect how we think. Happy Blog Anniversary!! I can't even begin to tell you how much your blog as influenced my sewing. Thanks for sharing all of your sewing adventures and knowledge with us! Here's to many more anniversaries. :) I'd love a chance to win a gift certificate. I just finished my first Sencha blouse and can't wait to make something else! Happy Anniversary! I love reading your Blog and I love Colette Patterns and their blog, as well!! I would love to get win a pattern!!! Either way, Congrats & thanks for the opportunity!!! I have been wanting a Colette pattern as I started sewing recently and am waiting until I am more experienced. This might be the push I need. Thanks! How wonderful! Congratulations! I wish I had your drive, lol! I'd love to win! I've been stalking Collette Patterns for a while now and drooling all over my computer screen each time. As yet I have not been bold enough to commit to one, though. Congratulations! I'm excited for this give away. That pattern looks so cute! I did a double-take when you mentioned your one-year blogiversary--you have crafted such an online presence in so short a time. I appreciate your thoughtful, well-written posts and look forward to more. Thank you. Collette patterns are so lovely, I'm after the nutmeg french nickers! Happy Anniversary Gertie! Congratulations on a very sucessful first year of blogging, I look forward to seeing what you bring us in year two. Great giveaway, I'll keep fingers crossed! I love your blog. You and Caroline from Diary of a Sewing Fanatic have inspired me to start sewing again. You're one of my favorite bloggers, love to read about your adventures overseas, happy anniversary. I'd love to try a Colette pattern, stick me in the number generator with all the other lovely ladies! Congratulations on running a great blog! It's gotten me back into sewing. Very nice meeting you on Saturday, btw. Oooh lovely! I've got my eye on the Sencha blouse. Happy blogiversary! oh oh oh. happy blogiversary! how exciting! I am dying to get the new colette dainties patterns. thanks for a grand giveaway! Happy Blogiversary! You're an excellent addition to my blogroll and I am always looking forward to reading what you have to say. Happy anniversary. I sewed my first Collette pattern last month - the Parfait pinafore in a yellow and white check - and it is great! Gasp! The Ceylon dress and Nutmeg knickers are seriously making me swoon. Thank you so much for giving us the chance to win such a fabulous giveaway! I would love to win a Collette pattern - please count me in. This is one fabulous blog, Gertie! Congratulations! Thanks for sharing your wealth of wisdom and sharp wit with your readers. It's a joy to visit. Thanks to you and Colette patterns for this giveaway too! Congrats - your blog is wonderful. Thank you for an inspirational, educational year! I teach beginners sewing and I have directed so many students to your site and they all report back what a great find it is. Your generosity in sharing your sewing journey is very much appreciated! These patterns look great! I always look forward to your new posts, and I have bookmarked most of your tutorials. This site has really helped me take my sewing to the next level. Thank you!